Seiri is in hospital and the nurses query her condition on whether she suffered heatstroke. Seiri thinks to herself that she had collapsed but how. She remembers that she had fully prepared for the day’s events but somehow she passed out. She also thinks that she had also spoilt everyone’s enjoyment of the Daihasei Festival. She opens her eyes to the Doctor (Heaven Canceller) and asks him if she is going to be alright. He tells her she would be fine. Back at the bus depot, Stiyl has recovered from his ordeal and is belittling himself. He then gets a phone call from Motoharu who tells him that Touma destroyed the magic spell preventing him from using magic. Stiyl tells him he is fine. Motoharu motions him to perform a search spell that he already set up earlier to locate Oriana. Stiyl locates Oriana and directs both Touma and Motoharu to her location. They spot her and they continue their pursuit. Ducking in and out of alleyways, they finally turn a corner to see Oriana board a bus. They chase after the bus, but it drives off leaving them behind. Motoharu asks Touma if there were any people on the bus besides Oriana. Touma at first ignores the question as it was not relevant. When asked again, he tells Motoharu that it is was just Oriana on the bus. 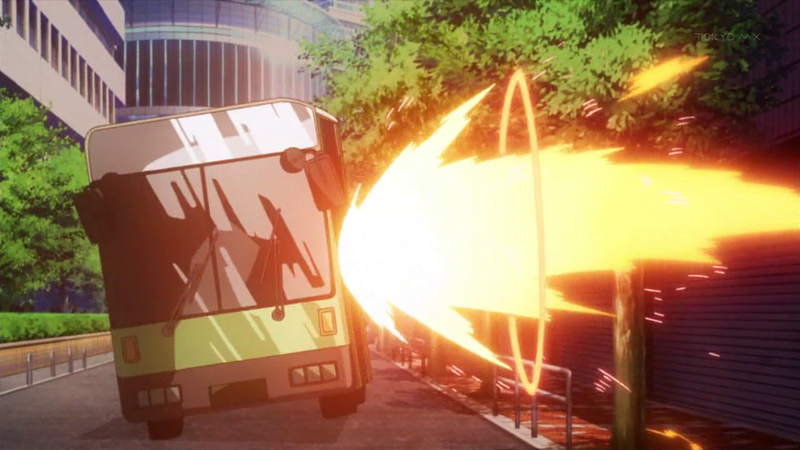 Motoharu tells Stiyl what bus Oriana is on and a rune card on the side of the bus explodes, forcing it to turn over and explode. 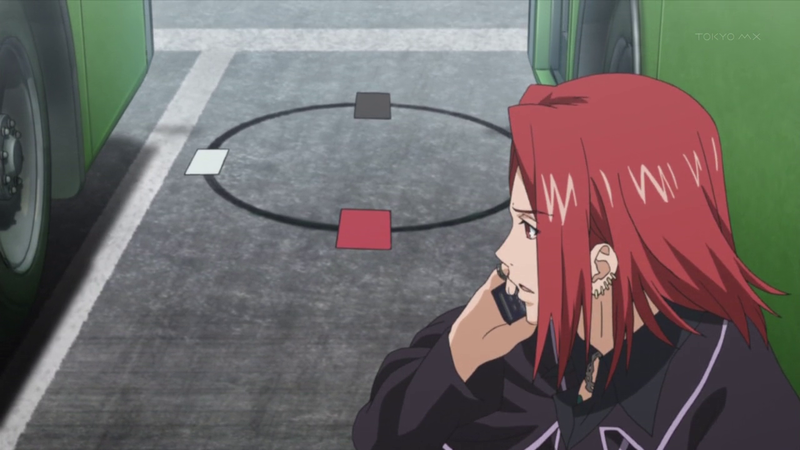 Motoharu tells Touma that he got Stiyl to place rune cards over all the buses back at the depot. They both begin to fight Oriana, Oriana activates a spell and it affects Motoharu, the spell counteracts any spell involved in healing. Touma tries to cancel the aura that surrounds Motoharu, but is unable to do so. Touma realises he has to take out the spell itself. He starts fighting with Oriana, but she lands several attacks on him. Eventually she sets a spell that forces Touma to stay still otherwise he would die. However he ignores this and walks towards Oriana. He dispels all the attacks she throws at him and he lands a punch on her, knocking her back and she loses grip of the item she was carrying. She gets up and teases Touma for unbuttoning her shirt and escapes across the roof of a building, she also adds that the spell will wear off after 20 minutes. Touma rings Stiyl that he has got the item Oriana was carrying. Stiyl tells him to destroy it with his ‘Imagine Breaker’. Touma opens the covering to reveal an ‘ice cream shop’ sign that Oriana had be carrying all along; a decoy. Meanwhile, Oriana undresses and changes into some clothes as she talks to someone using a spell card. The person on the other end of the conversation is worried about what happened to her. Oriana guarantees that everything is fine, despite the fact that someone else has already gotten the billboard. Meanwhile, Laura Stuart is meeting with Charles Conder; the curator of the British Museum, who tells her a shocking development. The weapon called ‘Stab Sword’ does not exist. However, he explains that the story behind Stab Sword is a tale that spiralled out of control and that the true identity of the sword is actually the Cross of St. Peter, the cross used to crucify one of the Twelve Apostles. Laura is alarmed by the new information as she realizes that when the trade is fulfilled, Academy City will cease to exist. Laura relays the information to Stiyl, who then tells the information to Touma and Motoharu. Although Touma has no idea what happens when Academy City is put into the dominion of the Roman Catholic Church, Stiyl tells him that it will tip the balance between science and magic to the favour of the Church, a fate worse than mere destruction. Later, Touma thinks about what Stiyl told him, when he is seen by Index at the park. Index carrying Sphinx, is ignored by Touma at first, but she manages to get his attention. 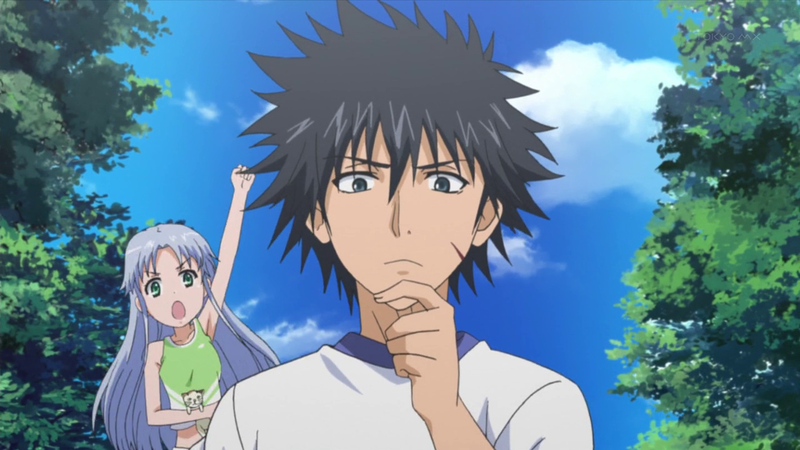 Touma is shocked that Index is wearing a cheerleader’s outfit wonders why she is wearing it. This reaction causes a misunderstanding and earns him several punches on his head. Index tells him that she wanted to cheer him on in his events but somehow always seems to be disappearing. However, Touma misinterprets Index that he thought that her anger was because she was hungry. This infuriates Index and she hits him hard on his head. Meanwhile, Touma’s parents Shiina and Touya are walking about the park and bump into Misuzu again, this time she is accompanied by Mikoto. Misuzu introduces Mikoto to the Kamijous (family of the one she likes; Touma) much to Mikoto’s shock. She then invites them to lunch together. Suddenly, Oriana bumps into Touya and apologizes. Touya; red faced apologizes too. However, he then apologizes to Shiina for fixing his eyes too much on Oriana. Later, the Misakas and the Kamijous meet up at a nearby restaurant. They are eventually joined by Touma and Index. Mikoto displays an outburst for not being able to find Touma anywhere, and even drags Index into the discussion. Touya adds to the discussion that Index has accompanied Touma to a beach one time, much to Mikoto’s shock. Index then soon becomes curious about Mikoto, asking her if she is Touma’s boyfriend. Before an argument ensues, Misuzu invites everyone to start lunch. Touma soon wonders if Misuzu is Mikoto’s sister and asks her. Misuzu introduces herself as Mikoto’s mother; Misuzu Misaka, which shocks everyone. Good episode with small bit of action. I think they are trying to bring in Mikoto in slowly, but now I think it starting to get tiresome. Touya seems to have trouble keeping his eyes from other women. (Well my head would turn if I saw Oriana walk around like that). There is still more story to this anime and since it is only 12 episodes here I definitely would like a third season. I am sorry that some of my blogs are late as a new computer game has got my attention lately (which I would blog at a later date) but I will do my best to catch up on them and get them up to date.